Posted on March 30, 2012 by Dave! 1) People I know will take advantage – my friends won’t. If ‘friends’ do, then really, how good a friend are they? 2) According to the example they gave (emotionally unprepared for the enormous responsibility and pressure of winning the lottery, took to gambling and womanizing to deal with the troubles adjusting to his new lifestyle), I have a hard time thinking that either my wife or I would not be able to handle it. It could happen I guess but given the chronic savers we are and the money sense we have, I’m willing to risk this one. 3) The theory is that winners have more credit available to them, use it, and overextend themselves. We are not credit people. Other than mortgage, we have lived debt free, paying off credit cards each month, not spending money we don’t have. I don’t think this is really in our DNA. 4) And? If they were long lost, it’s not like I am going to miss them when they come, are denied and leave. 5) Target of scams? Having been fortunate enough to have my Barrister and Libyian email friends already contact me to send over the fortunes that they have gotten for safe keeping, I feel safe in saying that while I am sure people will try and try more often, I think I am ok with the scam part. The lawsuit part I could see as problematic. Will need to up my liability insurance and probably install security cameras around my house. I should be able to afford those measures however. To sum it up, I am still ready to win my 11 million this evening and begin retirement. One may have problems when you are rich but they are a better set of problems than if one is poor. I will be sure to let you all know if, er, when I win. The first (and only) round is on me. Cheers! 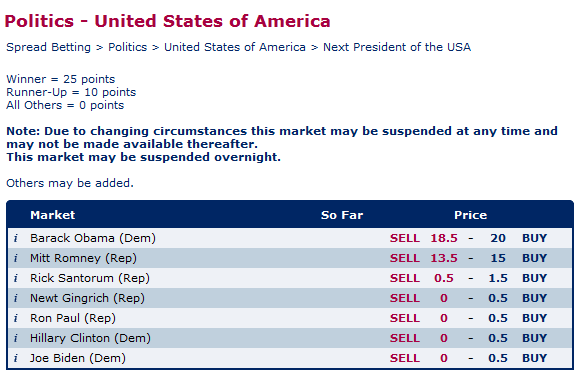 How are the markets currently handicapping the 2012 election? Sporting Index (A UK spread betting index) has him at 62. No, you can’t arbitrage the two. Markets are higher this morning on no major news except for the increase in the European firewall. There is probably an element of end-of-the-quarter window dressing to it as well. Personal Income came in +.2%, lower than expectations, while Personal Spending increased .8% higher than expectations. Inflation data came in as expected. Overall, no reaction in the futures. Chicago Purchasing Manager, Michigan confidence, NAPM, and some revisions are coming out later this morning. The NYT notes that Moody’s may lower the credit ratings for B of A, Citigroup, and Morgan Stanley in mid-May. The side effect of this downgrade would be to kill their derivatives businesses, as the lower rating will force them to put up much more collateral against their derivatives books, and force many large buy-side clients to trade elsewhere. This could be the impetus to turn Citi and B of A back into plain old commercial banks. Goldman is raising money for a new fund to buy distressed home loan bonds without government backing. The documents state this is a bet on improving fundamentals in U.S. housing. The story also goes on to say that Goldman bid on mortgage bonds from AIG in a Feb 8 auction, and decided to hold the merchandise instead of selling it. Most of these bonds are trading in the 50s. Non-agency MBS have done well this year as credit conditions have eased – enough that some funds are paring their bets. Markets are weaker as S&P warns that Greece may have to restructure its debt again and a disappointing report from H&M. Best Buy reported better-than-expected earnings this morning and will close 50 stores. The third revision to 4Q GDP was released this morning, unchanged from the 2nd revision at 3%. Initial Jobless claims were slightly higher than expected at 359,000. Bloomberg Consumer Comfort and Kansas City Fed come out later this morning. Bill Gross of PIMCO told Bloomberg that the Fed will probably concentrate on supporting MBS once Operation Twist ends in June. He referred to a “sterilized twist” where the Fed would buy current coupon MBS and simultaneously repo out the Treasuries. This would cause MBS spreads to tighten. So even if the sell off in Treasuries continues, mortgage rate may not rise as rapidly. Bloomberg had a good interview with FHFA Acting Director Ed DeMarco regarding principal forgiveness on underwater homeowners. It certainly does not appear that a mass taxpayer-funded principal forgiveness, (or cramdown for investors) is in the cards. FHFA prefers to mod interest and term first in order to make an affordable payment. If they cut the principal and the house increases in value, the borrower gets all of the benefit. If they don’t cut the principal, then taxpayers share in that upside. Ed has been a pinata to the Left who want mass cramdowns. American borrowers fear the Repo Man over everyone else, at least according to a TransUnion survey cited in the Washington Post. It used to be that the mortgage payment was the first priority, but with foreclosure pipelines so elongated, the car loan now takes priority. Dealbook has been the go-to place for all things MF Global. Yesterday, regulators held a hearing with several top executives of MF, who took the Fifth. The CFO has apparently offered a proffer statement, which means he is negotiating to talk. Markets are flattish after Durable Goods orders, which came in below expectations. February Durable Goods came in at 2.2% vs 3% expectations. Bonds and mortgages are off slightly. June 10-year bond futures are trading at 138 after bouncing off a low of 135-05 last week. Mortgage applications also fell 2.7% for the week ending Mar 23 as the backup in mortgage rates hurt refinancings. The American Bankers Association released its Real Estate Lending Survey yesterday. The survey of 185 respondents, of which the vast majority are small community banks, said that lending conditions at the end of 2011 are about the same as they were at the end of 2010, with regulatory uncertainty as the main concern. 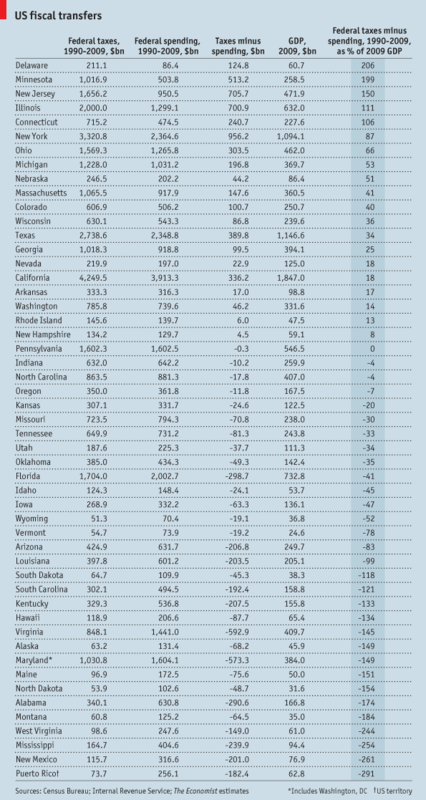 The average delinquency rate fell slightly over 2011. Is Mark Zandi becoming the Abby Joseph Cohen of real estate and the economy? Seems so. The Washington Post locates a pocket of optimism in real estate, citing Zandi and some Northern Virginia Realtor. Washington DC real estate inhabits a world of its own, so I don’t think it necessarily applies nationwide. Redwood Trust did another jumbo securitization yesterday, more evidence that the private label market is returning.